Swiss cheese automatic from nirvana seeds is an auto-fem version of their super smelly skunk strain Swiss cheese. This autoflowering cannabis strain was created by Nirvana seeds by crossing auto jock horror with a Swiss cheese clone. The result is very stinky so is not for the stealth grower but the big buds, old skool flavour and cerebral high make it well worth a go. Meet Pepe le Pew’s little niece and boy does she reek. This Swiss Cheese Automatic will knock you of your feet with her penetrating smell. Not suitable for a discrete grower. She is, however fast flowering, has big internodes and creates tight, bulging buds. 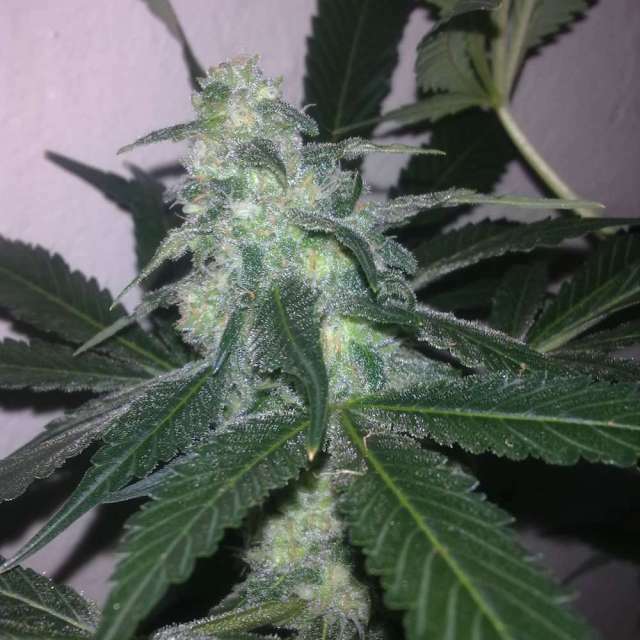 Nirvana Seeds took their Jock Horror Automatic (with her Mexican Haze Roots) and a classic Swiss Cheese clone and combined the two to create this amazing autoflowering strain. The Swiss Cheese Automatic provides a powerful cerebral effect that will activate your senses with a soothing physical effect towards the end. The aroma is both pungent and sweet, just like a proper old-school Cheese. The taste clearly has that cheese taste too plus a peppery aftertaste.